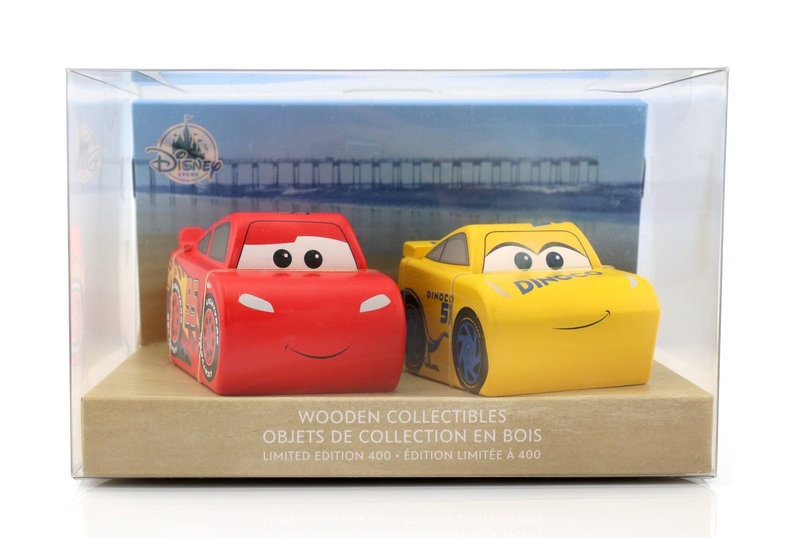 Now flash forward to last month, when ShopDisney.com released (to my surprise) another set; this time from Cars 3 and featuring wooden collectibles of Lightning McQueen & Cruz Ramirez! 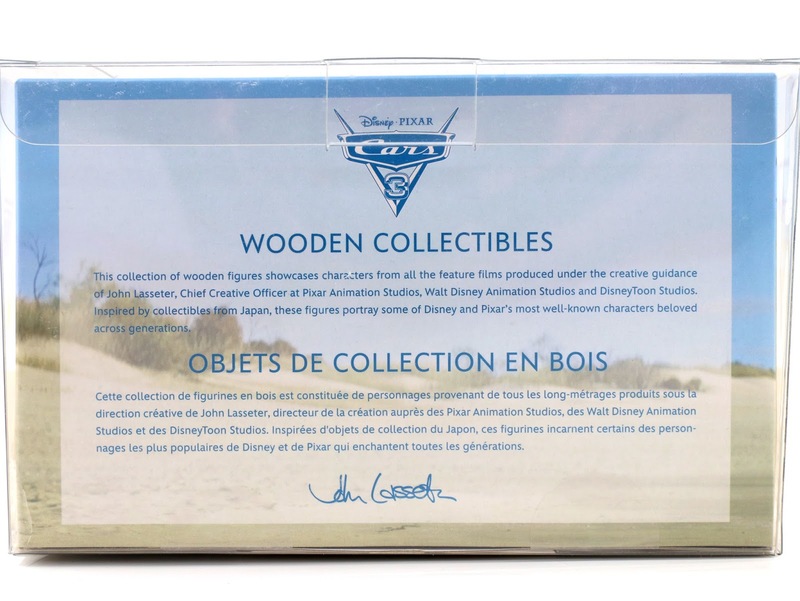 This set is a limited edition of only 400 and is sold only on the ShopDisney website HERE (not sold in stores). 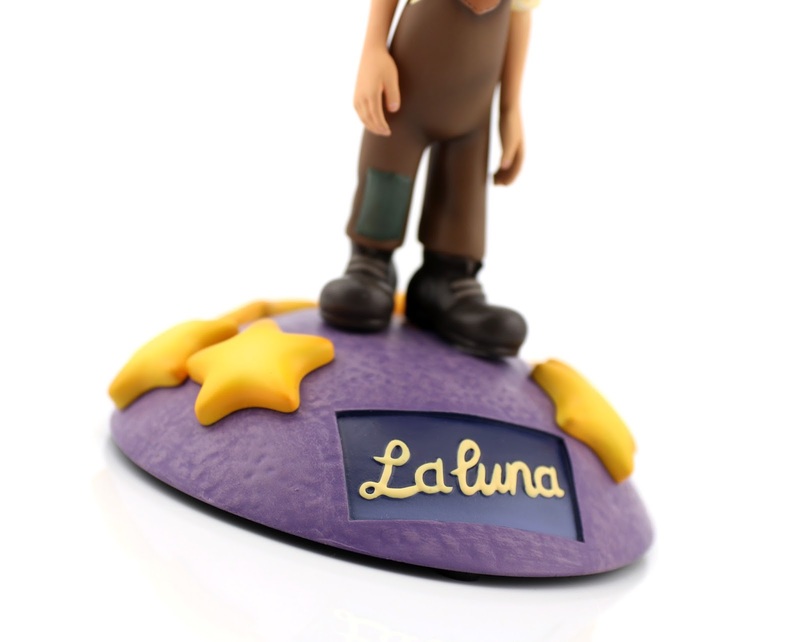 I LOVE the way these characters are stylized and will go perfect with my Toy Story ones. Note: You may have have seen this already, but even John Lasseter's signature D23 Expo Reyn Spooner Hawaiian shirt last year featured these and other characters (from films he's worked across all studios) in this same Japanese style (which you can view and purchase on eBay HERE ). 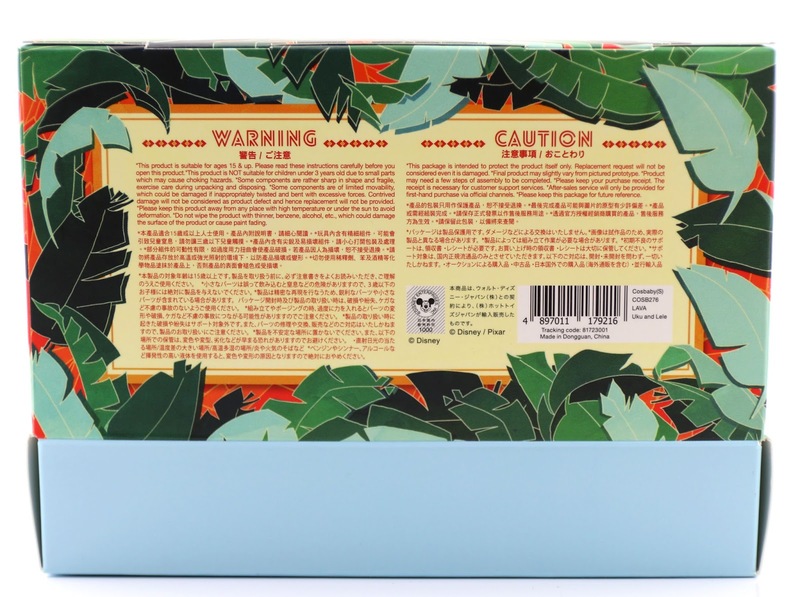 Once again, the packaging is so clean and minimal—definitely marketing to adult collectors like myself. You can tell right away from looking it it that this is a special item. 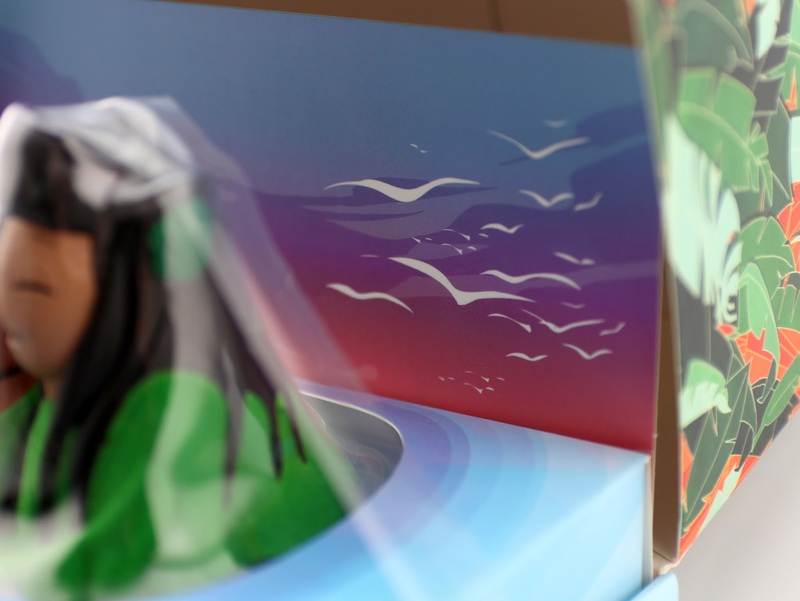 The box is essentially one big clear plastic case with a cardboard "sandy" ground base and Fireball Beach as the backdrop. 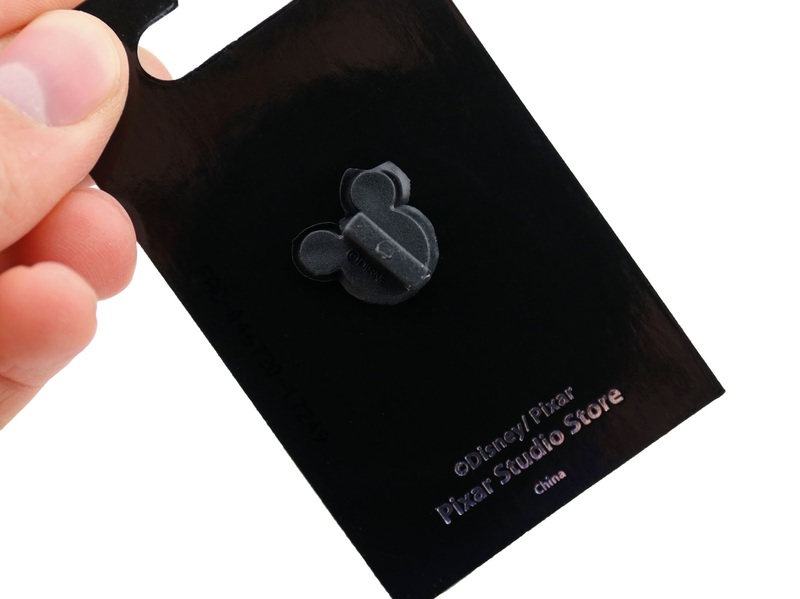 The Disney Store logo/seal is featured in the top left corner. Though I didn't remove the cars completely (I wanted to keep these ones relatively mint for now), I was able to slide them out of the plastic case [very easily] for these photos and then slide them right back in when I was done. If you wish to do the same, I found it best to open it from the bottom. 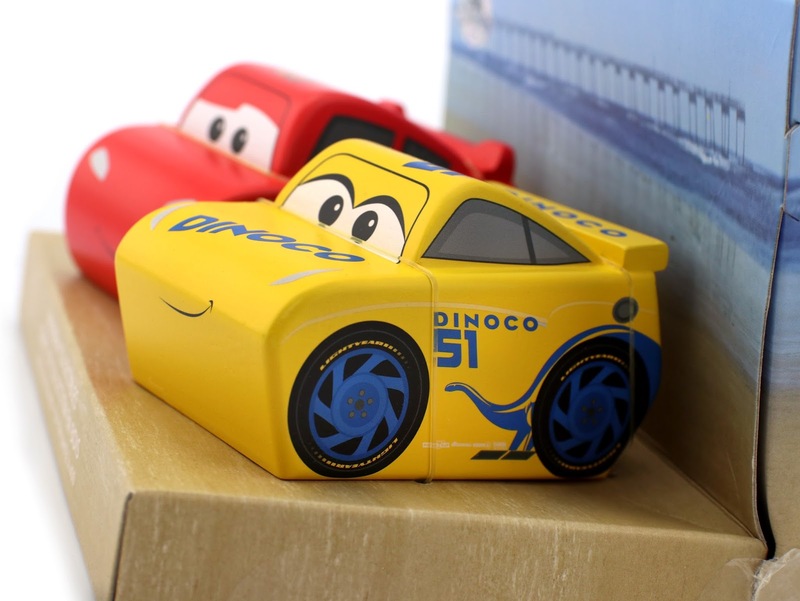 Take a closer look at Lightning McQueen and Dinoco Cruz Ramirez below! 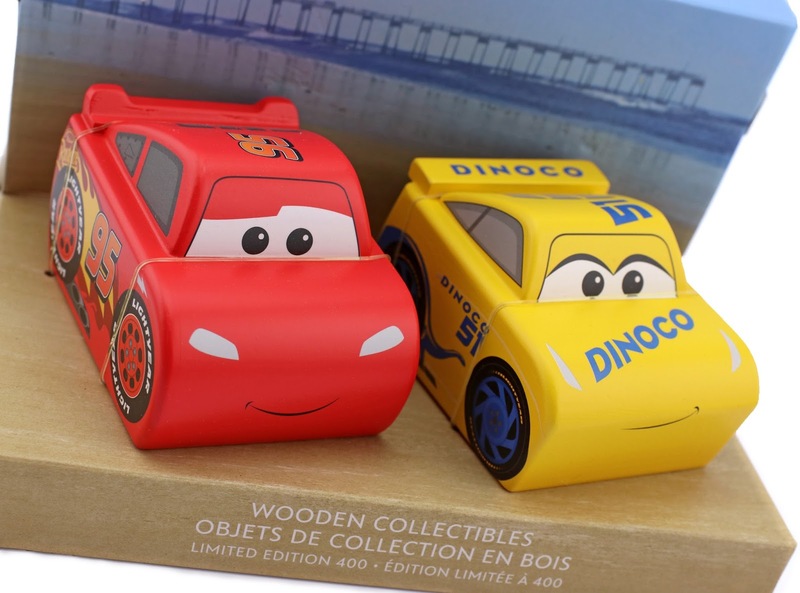 Just like the wooden Buzz & Woody collectibles, these are maliciously designed, quality crafted and hand painted. They're made of a very lightweight wood and appear to be hollow and not solid. How cute are they, right?! 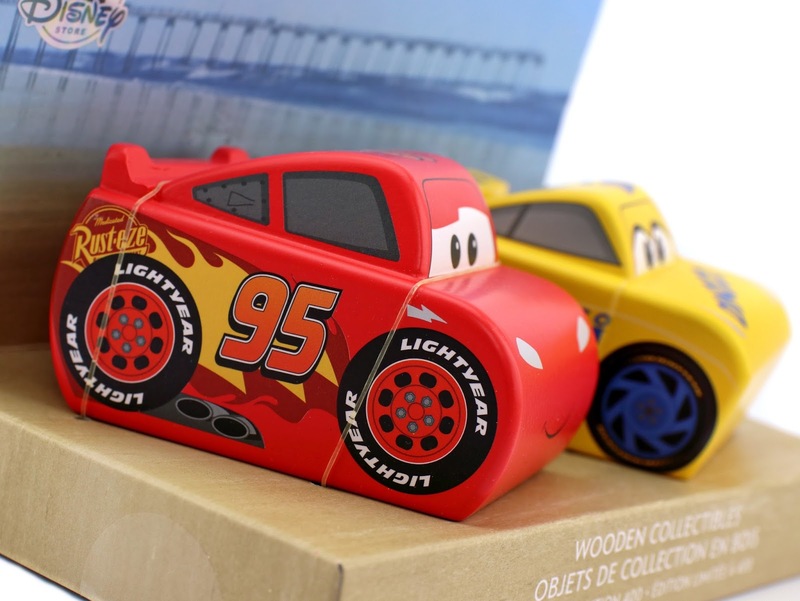 Each car is 2 1/2'' H x 2 1/2 W'' x 3 3/4'' L. The dimensions of the packaging are 5'' H x 8'' W x 5 1/2'' D. Retail price for this set is $59.95 (which yes, is extremely pricey, but hey, it's Disney and a limited edition—it's what I expect at this point). 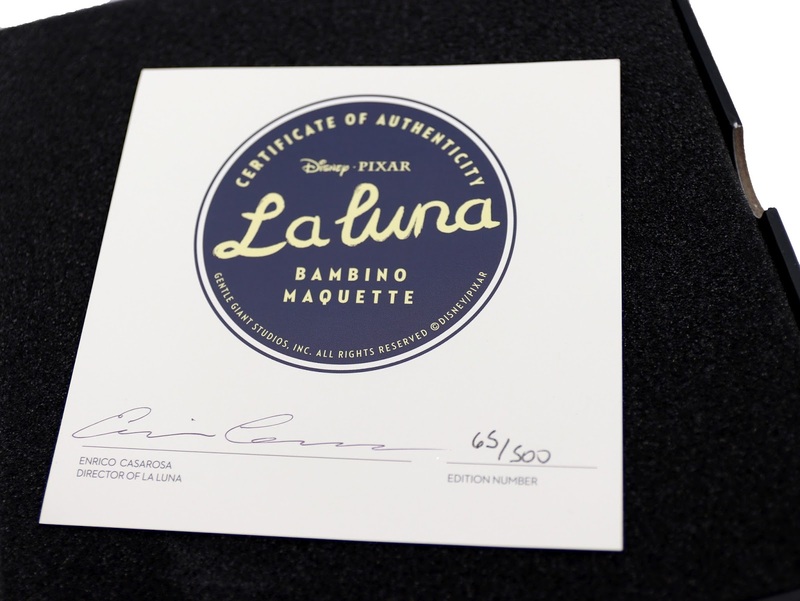 No limited edition item is complete without a certificate of authenticity. My edition number is 37/400—not too bad at all! The certificate can be found under the cardboard base. As a big fan of the Cars trilogy, this is a most welcomed addition to my collection! And what's even more exciting? 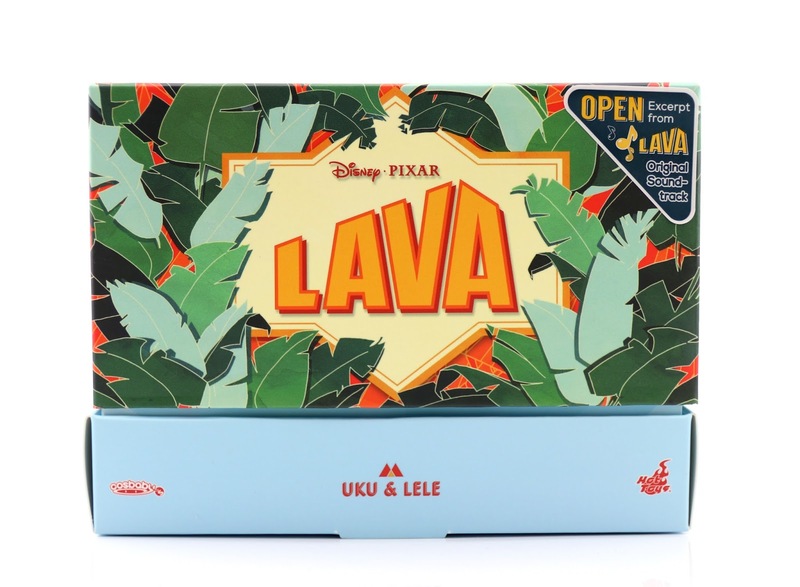 It seems as though this line is continuing, since a Monsters Inc. inspired set (featuring wooden Mike & Sulley) just came to ShopDisney.com pretty recently! Look for more on that one soon right here. Again, if you're interested in this set, I wouldn't hesitate too much. 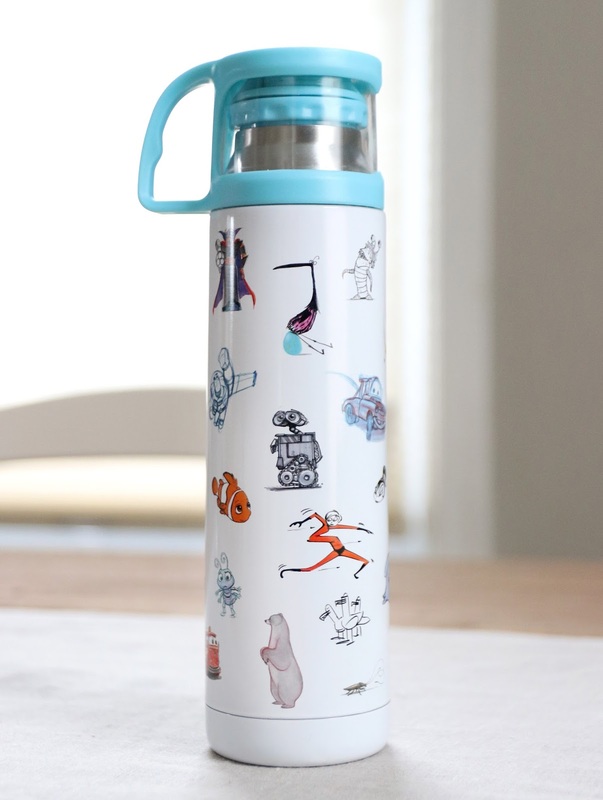 It's still in stock on the ShopDisney site HERE (surprisingly), but once it's gone, it's gone. Be sure to let me know your thoughts or any questions you might have in the comments below! Hey everyone! 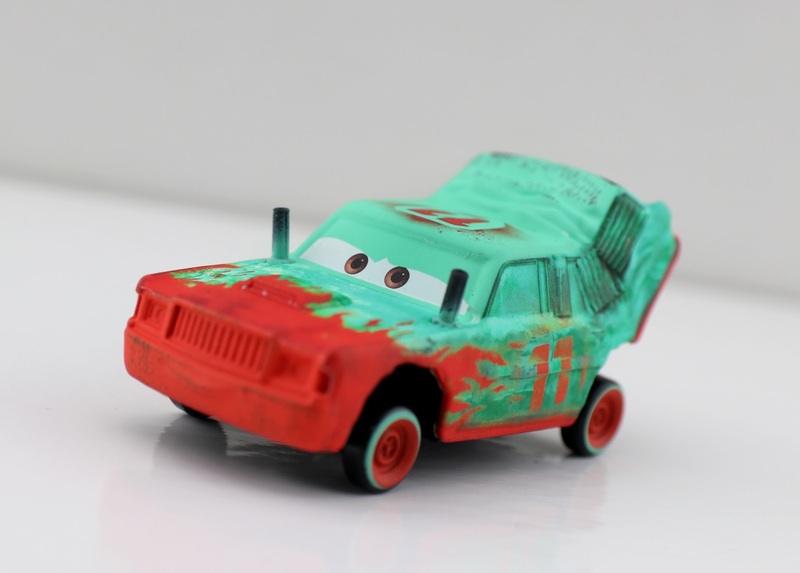 Tonight I'm taking a look at another Mattel Cars 3 1:55 scale diecast...Morgan Martins! 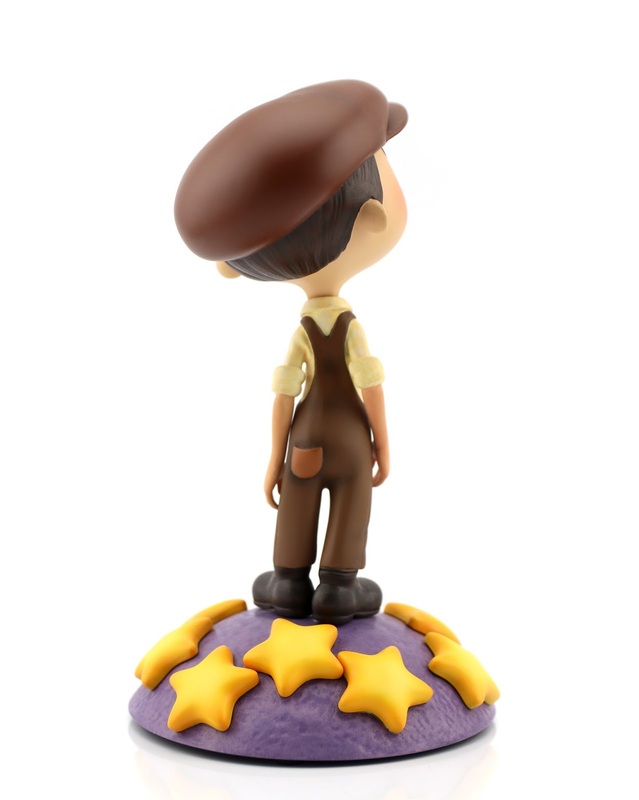 This character was released last summer as a "Super Chase" and is part of the "Deluxe" sized assortment. And if you're new to Cars collecting, cars designated/labeled Super Chase are just ultra rare releases—no more than 4,000 units are produced per Super Chase (they're also not included on the year's visual checklist, so they're lesser known). They're very, very hard to spot in stores. I've had to get most of mine online over the years. 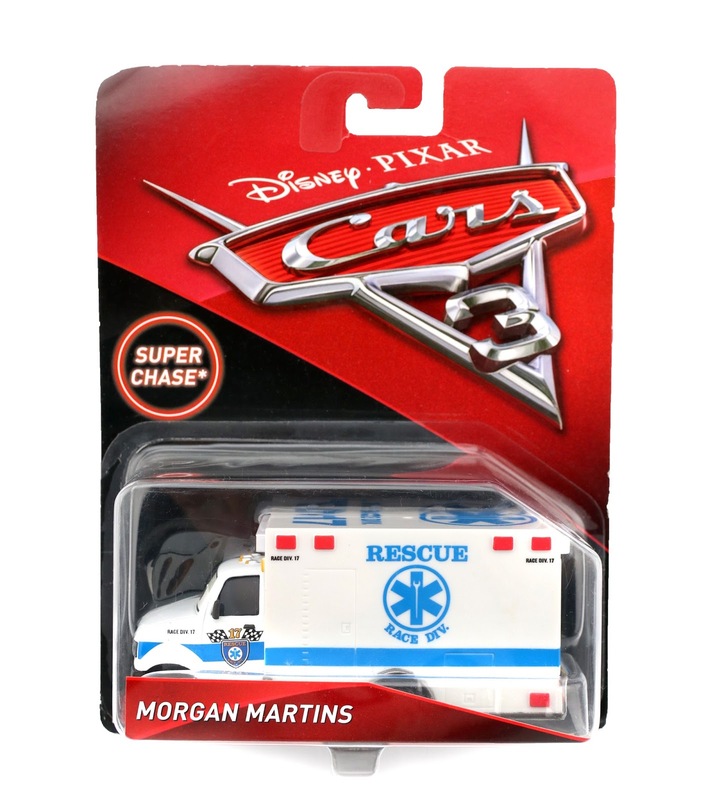 This is an odd choice for a Super Chase; not that it isn't a cool vehicle (it looks great and it's definitely unique to get a new ambulance/rescue vehicle), but because Morgan didn't actually ever appear in movie. Maybe his part was cut from the film after Mattel got the designs? I feel like he would have originally been in McQueen's crash scene, but I'm not 100% sure where this character was set to appear (if ever). 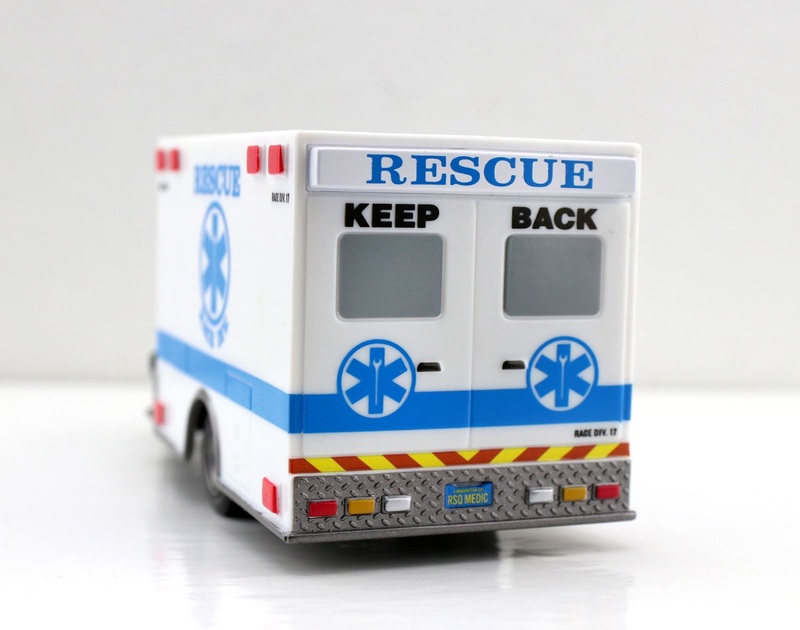 Like usual with the bigger Mattel releases, the only diecast metal part to this toy is the front cab. Everything else is plastic (which I understand, but it's always a tad disappointing). Overall though, for what it is, it looks good! 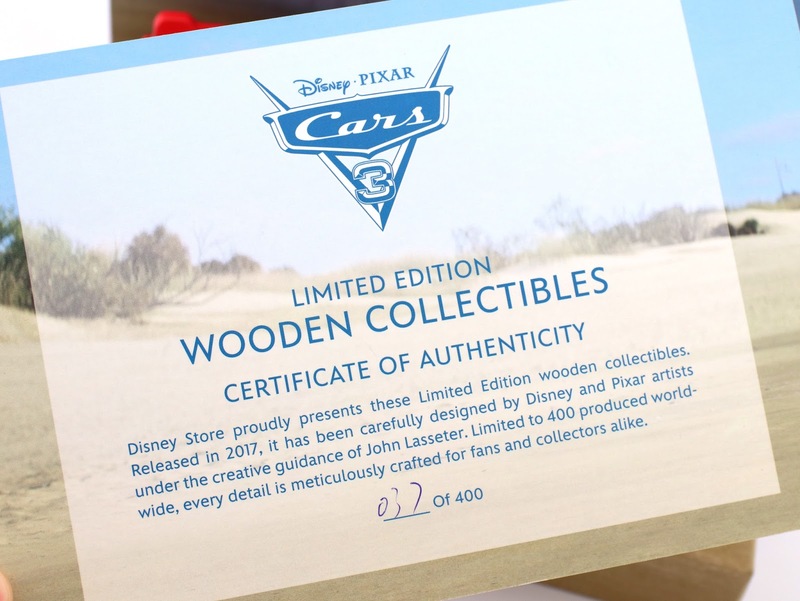 If you're a diehard Cars collector like myself (with that completist mentality), this is a must have just because of the rarity of it. For you casual collectors, unless you're able to spot it in stores (which if that's the case, grab it!! ), you can probably skip this one (especially since he's not even in the film). I picked this one up on eBay for around $13 (which is not bad at all for a Super Chase) and I'll include a link below. You can also check eBay HERE using this direct link. Happy hunting! Let me know your thoughts or any question you might have in the comments. Have you spotted Morgan in stores? 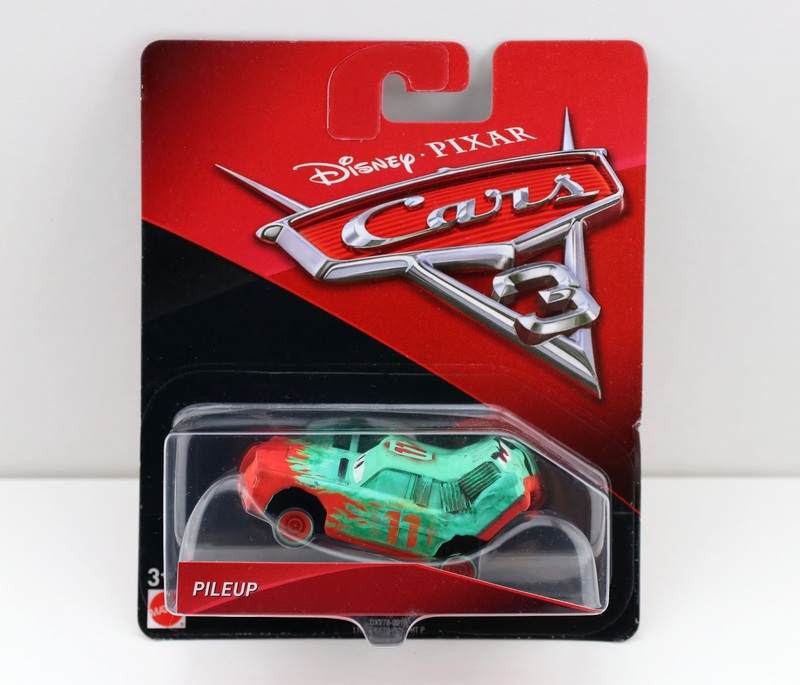 What's up Pixar Cars fans!? 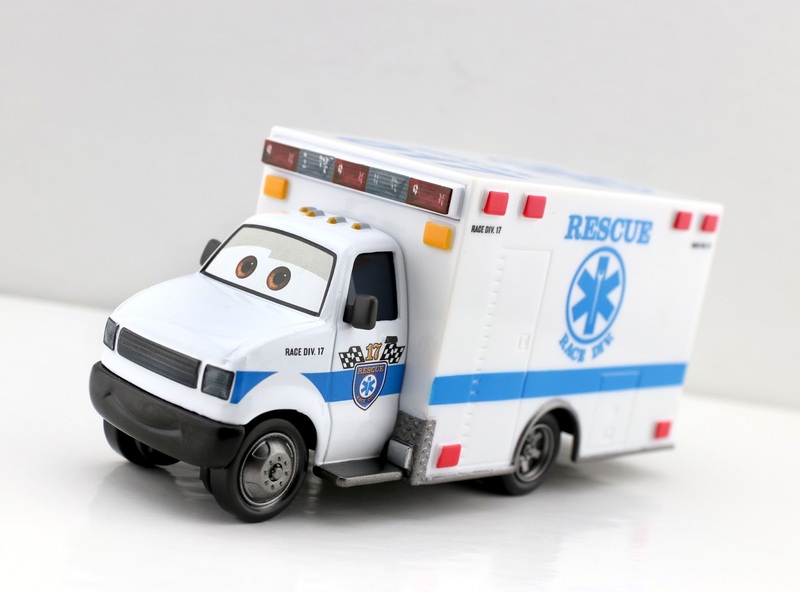 For tonight's post, I'm taking a quick look at yet another fun Disney·Pixar Cars 3 Mattel 1:55 scale diecast. Here we have "Pileup", one of the Thunder Hollow Crazy 8 contestants seen in the the film. I was thrilled to have found this at Walmart a couple weeks ago! 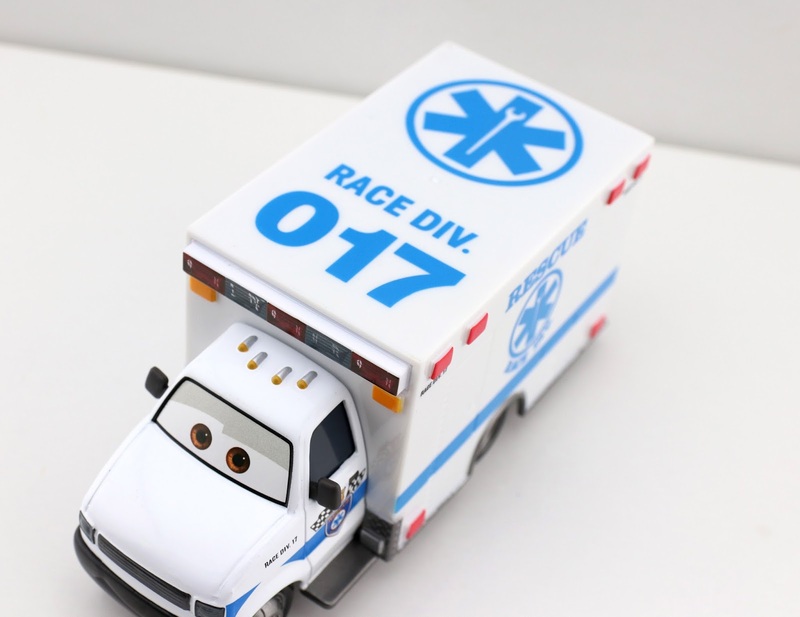 Pileup is racing number 11 and is the car who enters the race backwards. He even has a shifty pair of eyes painted on his back to throw off the other demolition derby racers! Admittedly I only just noticed this when I watched the scene again to take the screenshot above. I love collecting the demolition race cars. They're always so unique, colorful and detailed! This one is no exception. It looks great. 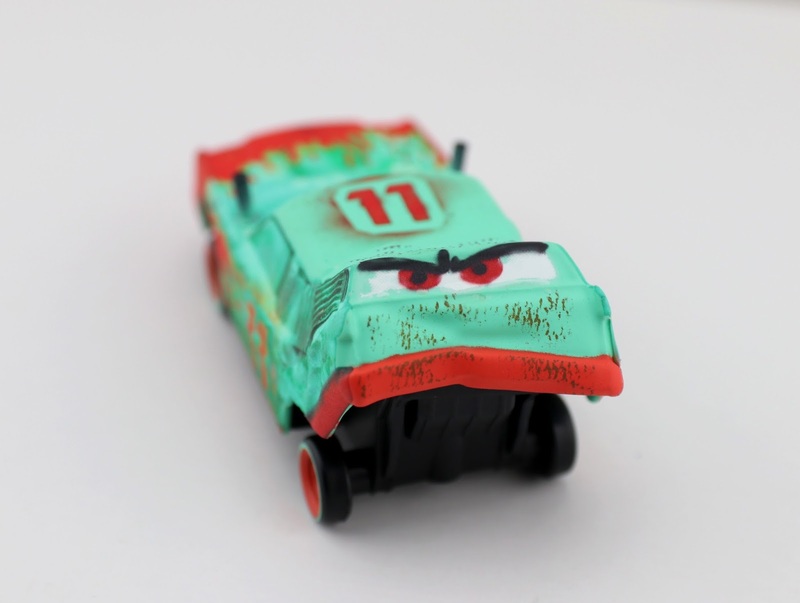 If you're still looking to add this one to your Cars 3 collection, you may be able to still find him if you search around at your local Target or Walmart stores. If you'd rather just pick him up online, you can visit THIS DIRECT LINK to current eBay listings or Amazon using the link below. Happy hunting! Let me know if you have any questions or comments. If you're a list maker like I am, then you probably can't ever have enough sticky note pads lying around. Am I right? Before you go load up on more of the basic, every day ones though, let me recommend these! 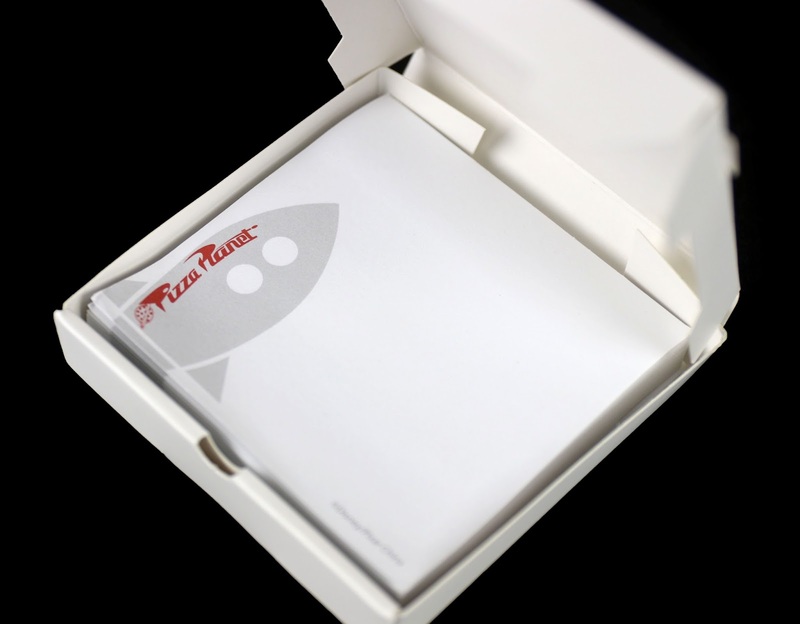 You Toy Story fans will appreciate this...check out this Pizza Planet sticky note set available currently at BoxLunch gifts. Don't they have the best stuff?? 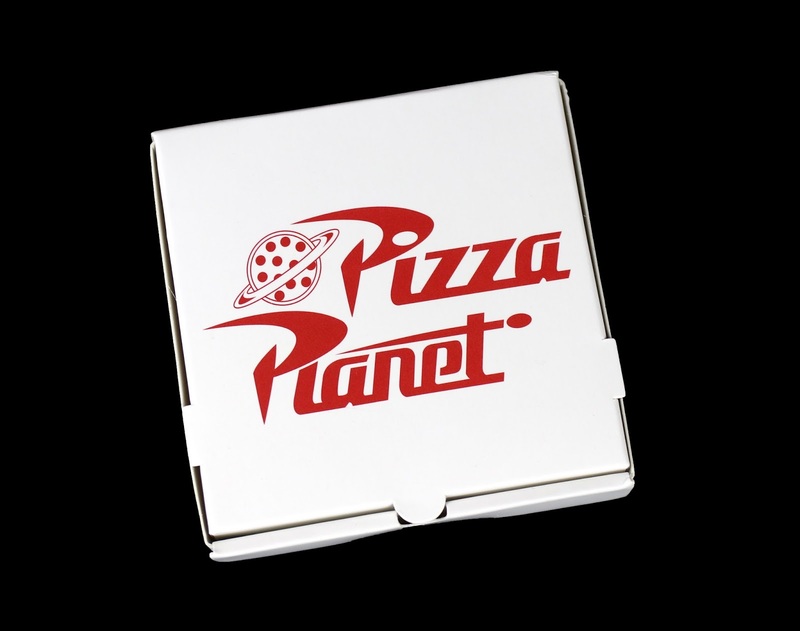 I love the fact that these sticky notes literally come in a mini 3.5" square Pizza Planet pizza box. 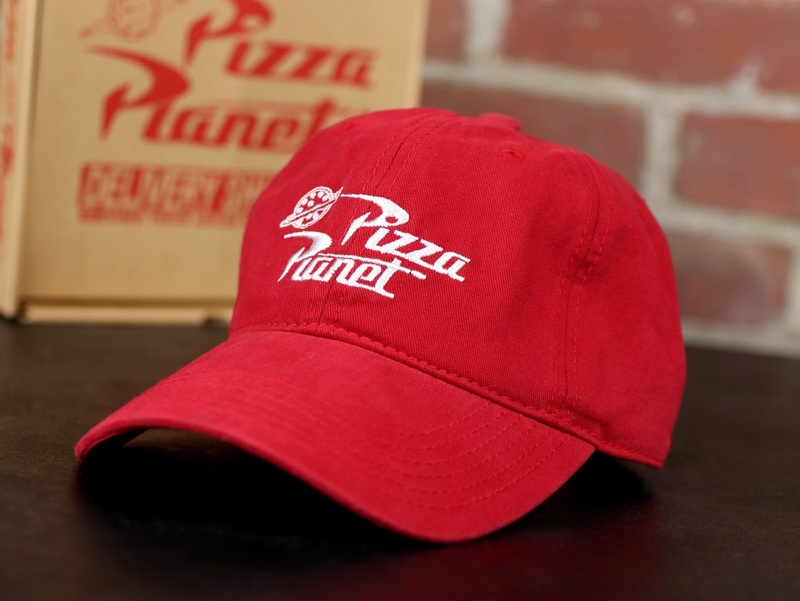 That sold it for me right there (and now I want Pizza Planet to be a real place even more). These are the perfect addition to any office/study desk! 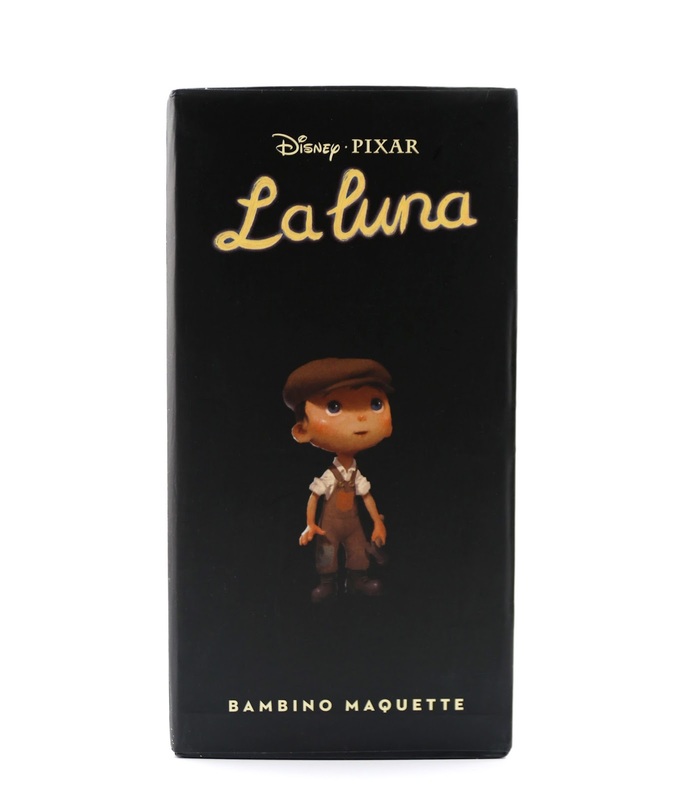 Find these at your local BoxLunch store (man I hope we get one in CT one of these days...I'd love to finally be able to shop there at a brick and mortar shop) or online HERE. Retail is $4.90. 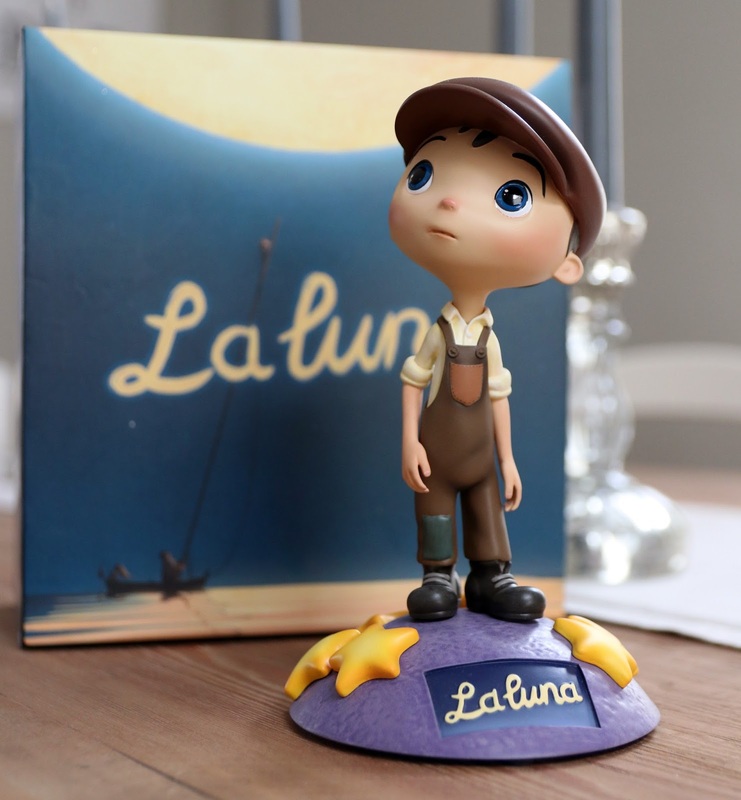 Ready for one of the coolest Pixar toys out there right now? 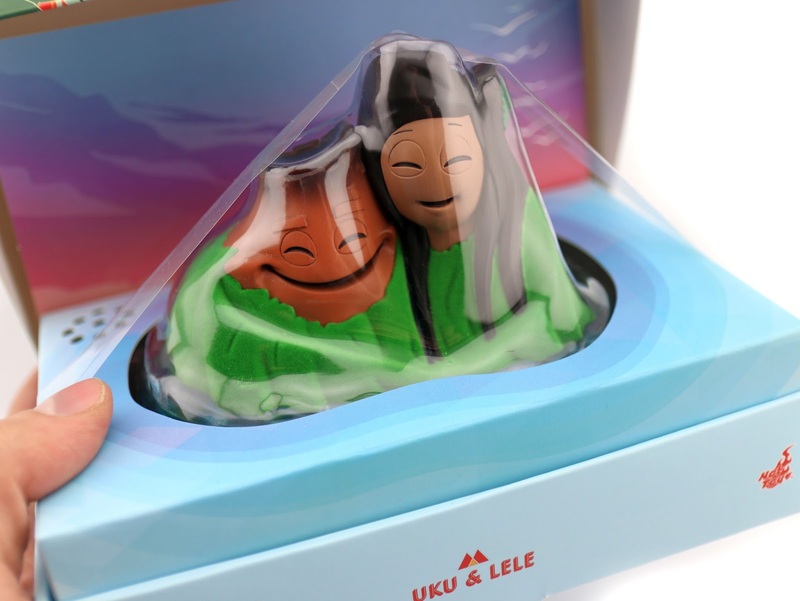 Check out this adorable LAVA Uku & Lele figurine by the Hong Kong based toy company Hot Toys! 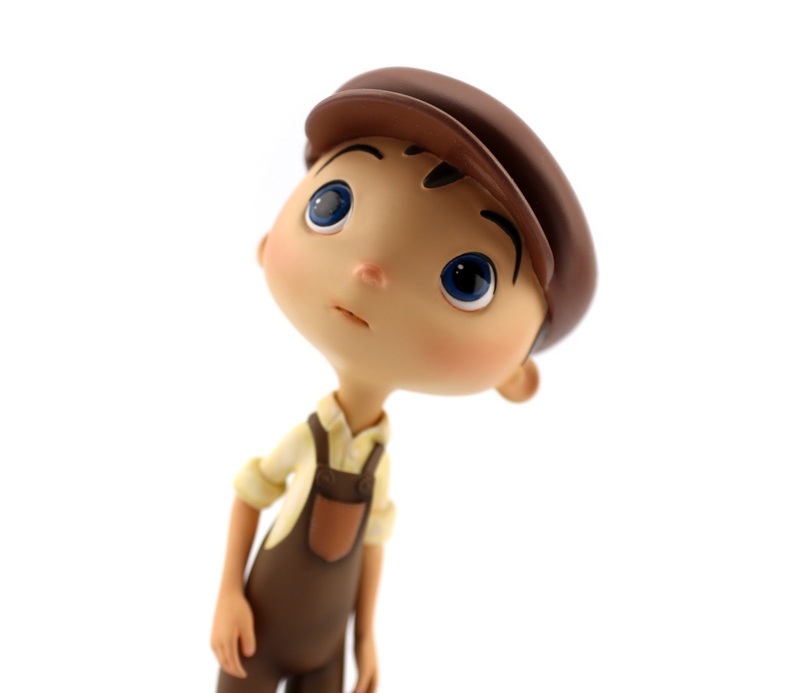 This is part of their popular "Cosbaby" line of stylized vinyl figurines and can only be found [currently] in China. I was able to purchase this a few weeks back from eBay for around $50 and free shipping! I'm not sure what the actual retail price is, but I felt that was fair enough. It's crazy that it's already been two years since I first saw this revealed. In early 2016, a leaked photo of the prototype surfaced online from some show floor (not sure if it was some kind of toy convention?) along with other new Cosbaby figures. It then appeared in a Hot Toys product guide (seen HERE). I was ecstatic about it! From then on though, there was no word on a release date or any additional info. I waited and waited with hope that it actually become available, until I eventually came to terms with the fact that it wasn't coming. Well, you know the end of this story. It finally came! What a huge surprise. This past October, Hot Toys officially revealed the product on their site and confirmed it was on its way in late 2017/early 2018. That of course proved to be true. And here it is! First of all, I love the collectible packaging—very minimal and clean. The best part though is that it sings! 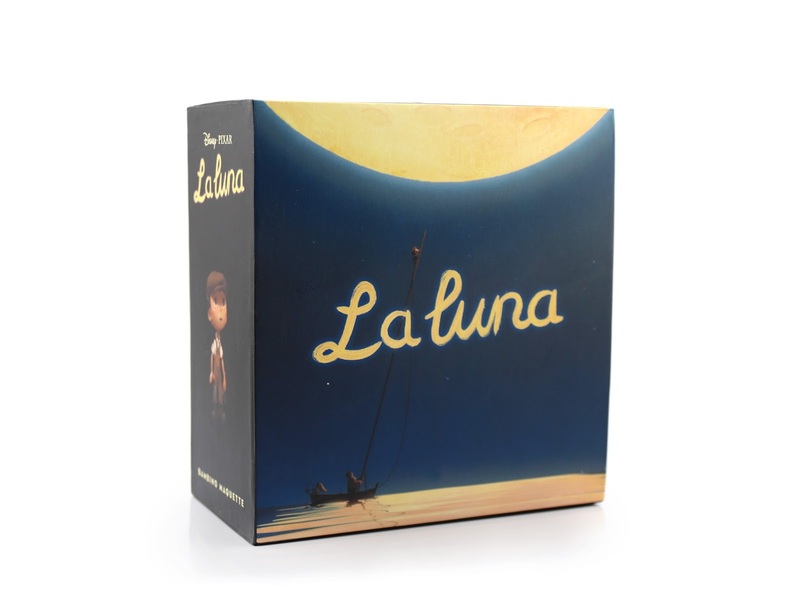 Yup, when you open the box, it plays a one and a half minute excerpt from the film's classic song. 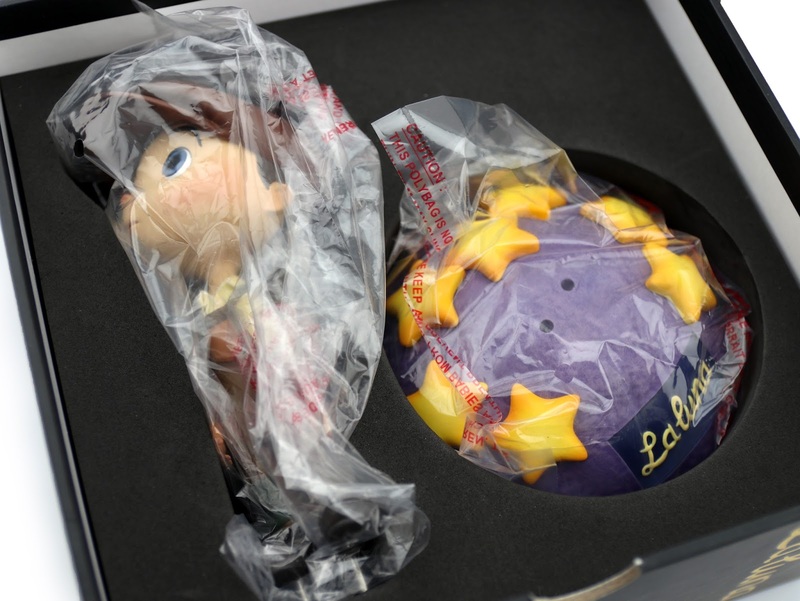 Note: To clarify, the sound board/speaker is in the packaging itself, not the figurine. The figure does not make any sounds. To shut off the song, just close the box. Here's what the figure looks like immediately upon opening! Just cut the plastic strip and remove the plastic covering and Uku and Lele come out very easily. The inside of the box is just as stunning as the outside. How pretty right? And here's the figure fully removed! It's pretty small, measuring about 3" tall and 4" long. 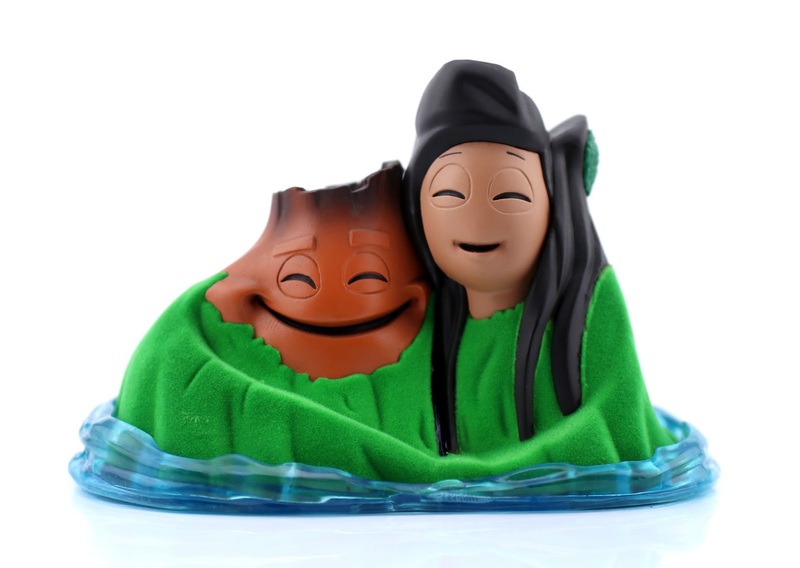 The entire figure is molded vinyl with the really nice added touch of fuzzy material for the lush greens. 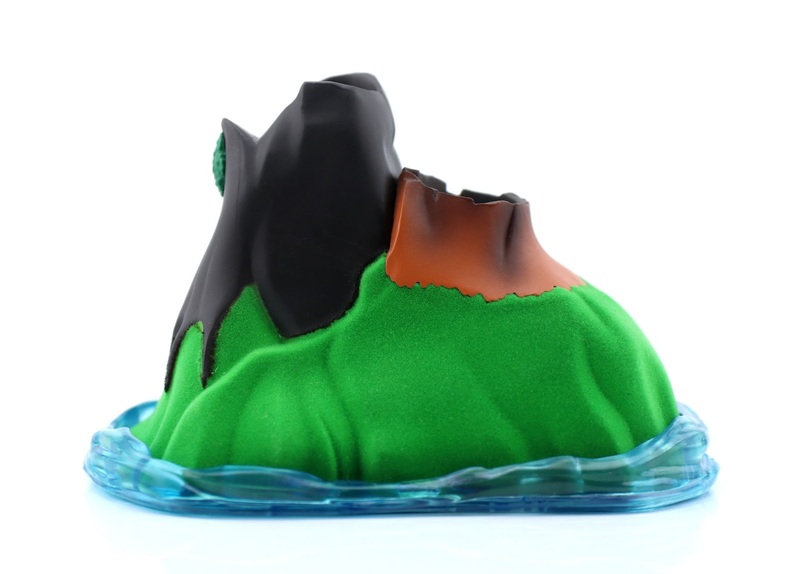 I also really like the translucent plastic used for the water at the base and for the "lava" seen within their tops! It's those little details that make this thing extra cool. LAVA (Directed by long time Pixarian James Ford Murphy), debuted in theaters with Inside Out back in 2015. 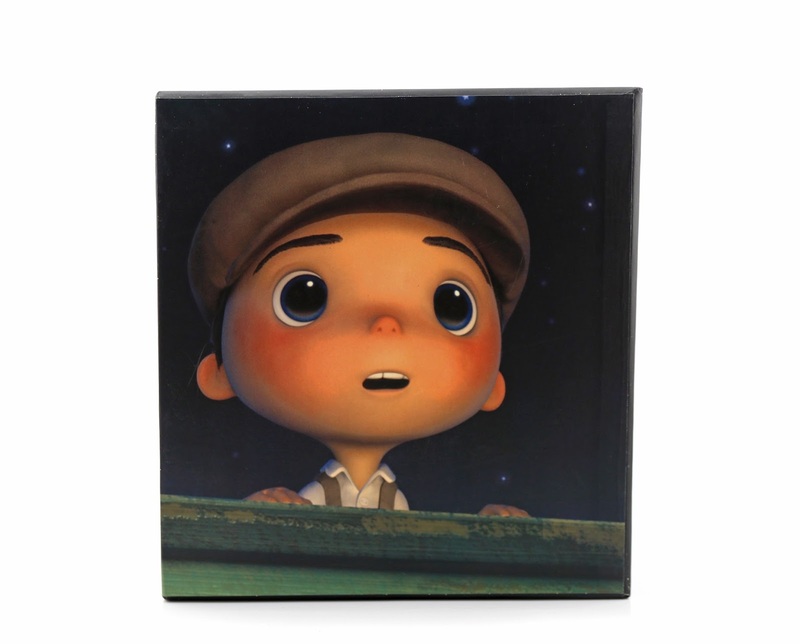 It has since become a favorite of many out there who adore the stunning visuals, heartwarming story and memorable song! It's one of my favorite Pixar shorts for sure and I'm thrilled to have it represented in my collection. This was worth the wait. Pick one up for yourself using THIS direct link to current eBay listings. 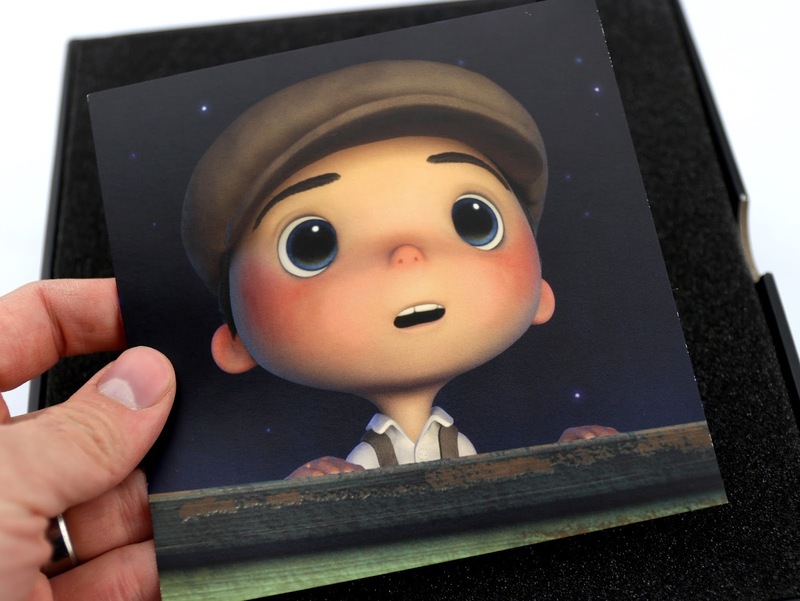 For all you Pixar fans/collectors out there, I seriously cannot recommend this enough. 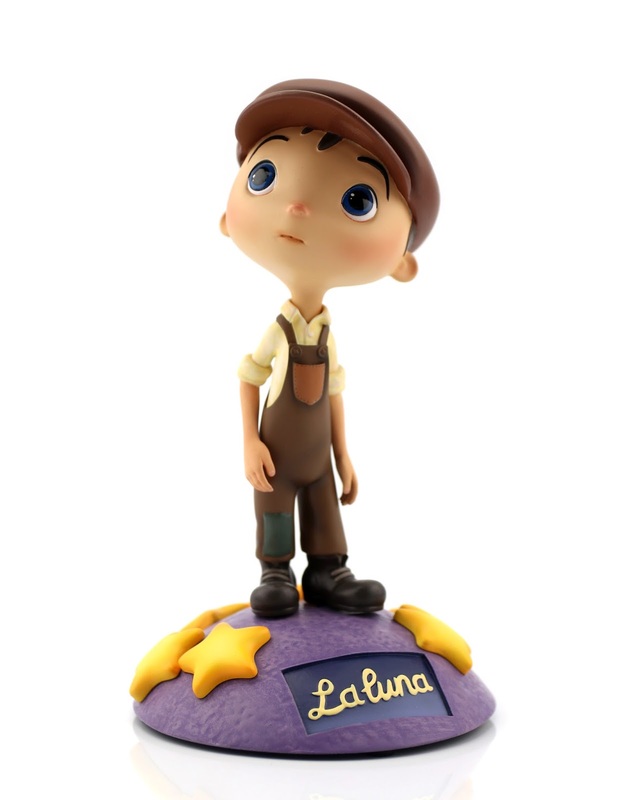 Remember how rare of a treat it is to get any merch based on the short films! 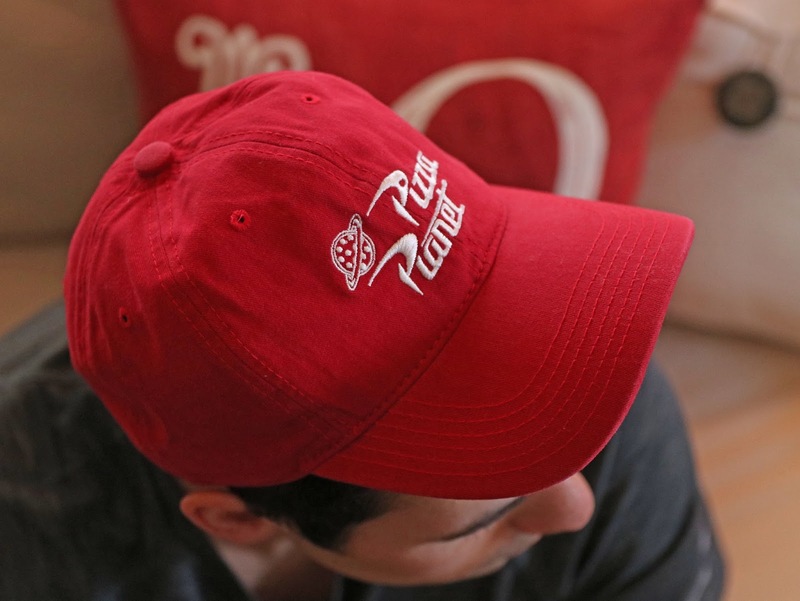 This is such a unique item and I don't want you to miss out on it. Additionally, you can watch my full 360° look/video review on YouTube using the player below! Be sure to like, subscribe and share you thoughts. 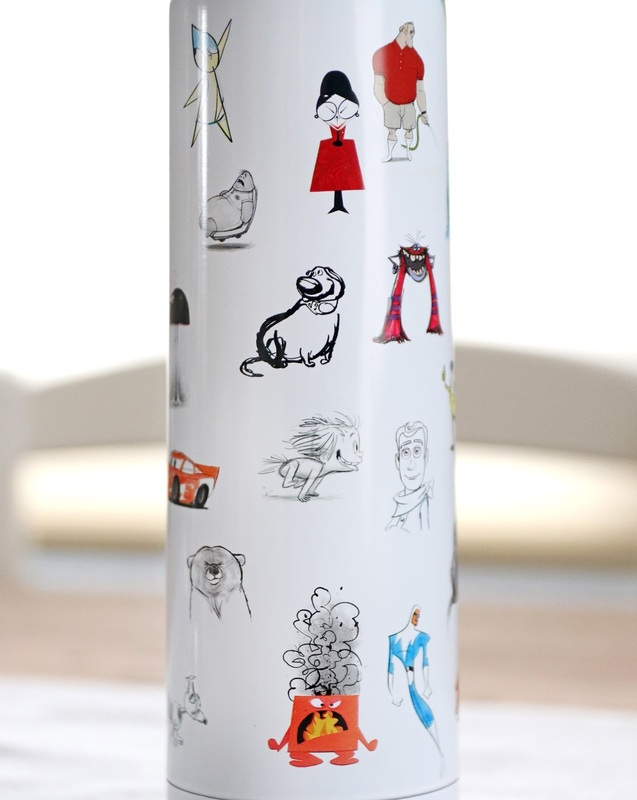 What do you think of this fabulous item?! For tonight's post, I've uploaded a brief video review of the brand new LAVA Cosbaby vinyl figure from Hot Toys! I'm going to save my full thoughts on this amazing collector's piece for tomorrow's detailed written post, but for now, enjoy this quick look. 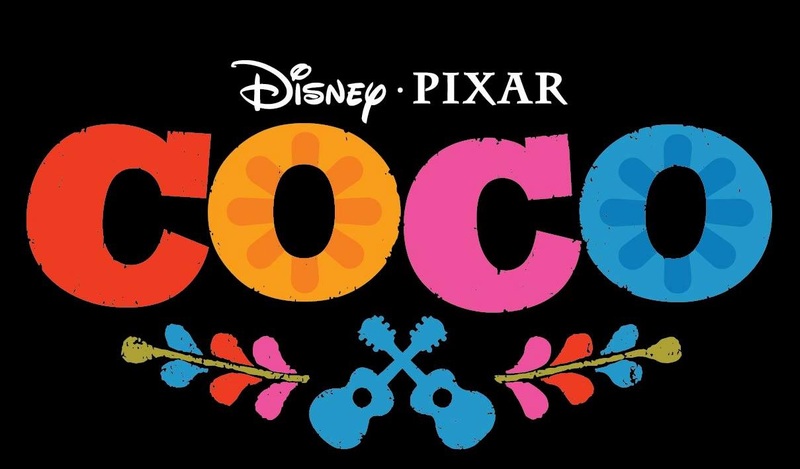 Here's another fun item I was lucky enough to pick up while visiting the Pixar Studio Store at Pixar Studios this past fall—this really pretty limited edition Coco logo pin! While I'm not a big Disney pin collector (I have a modest collection of a few that have stood out to me over the years), I couldn't resist this one for its rarity and fantastic design. 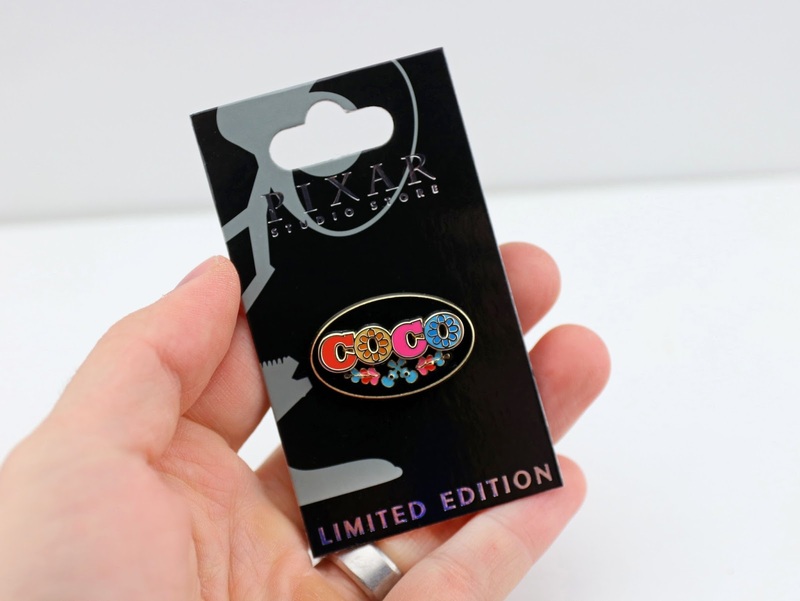 I've always loved Coco's iconic, vibrant logo and I'm thrilled to have it represented in pin form. 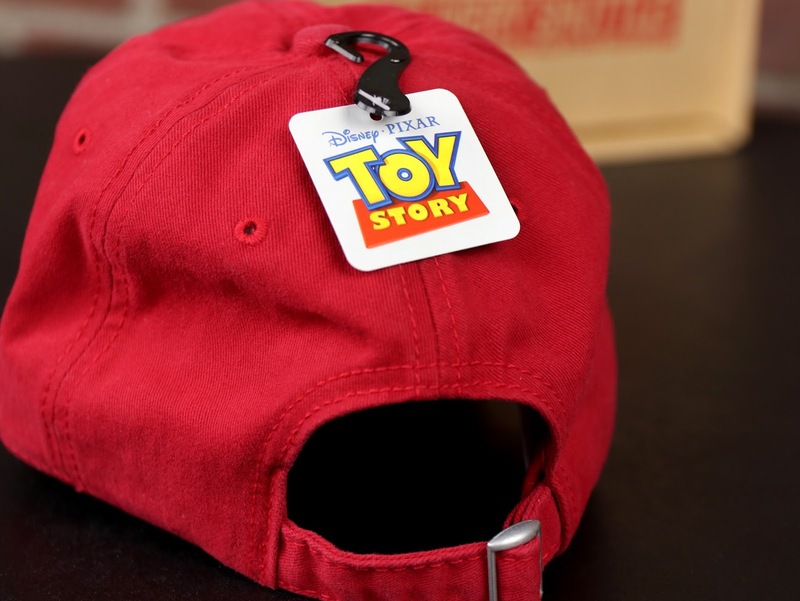 My questions of the day: Have you shopped at the Pixar Studio Store? What did you purchase? Let me know your thoughts in the comments below! What's up Pixar fans?! 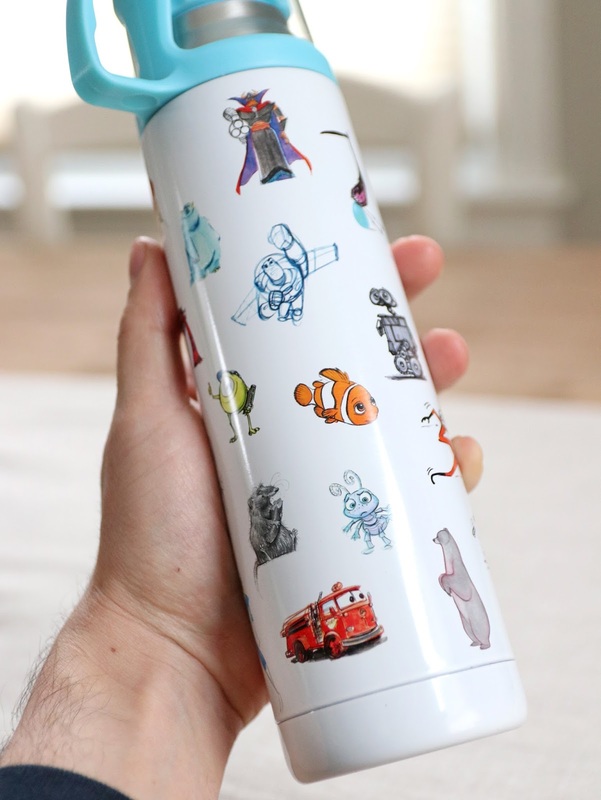 I'm back for another blog post and today I'm taking a detailed look at this fantastic Pixar character concept art water bottle from ShopDisney.com. 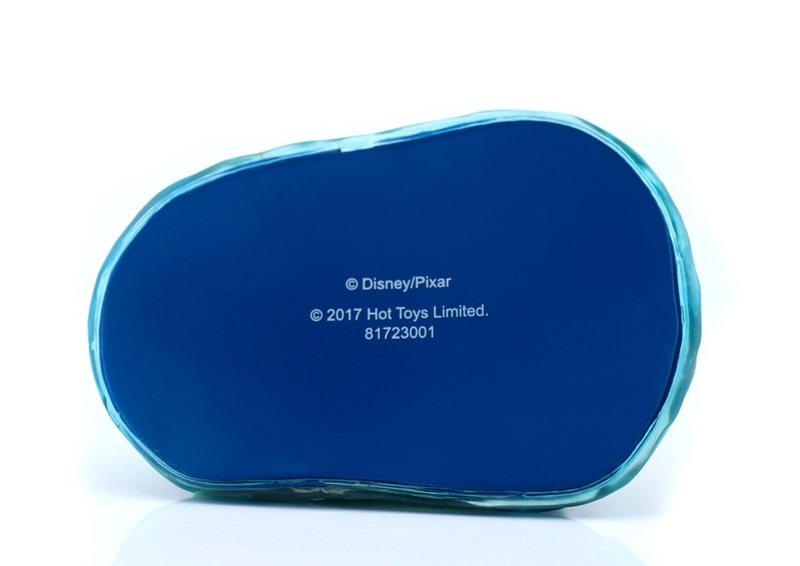 This originally debuted last July at the 2017 D23 Expo in Anaheim, CA and was then made available to the public on the Disney Store's website soon after. 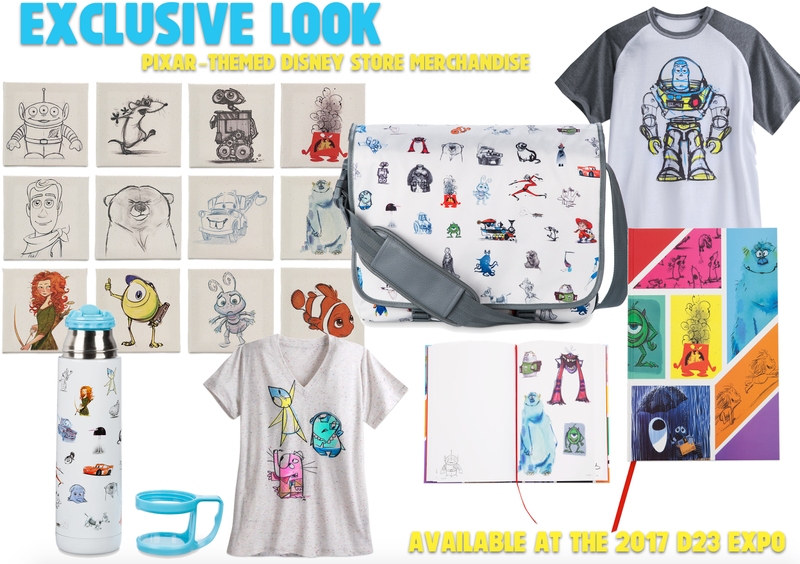 It was part of a larger line of products featuring Pixar sketch/concept art, which included shirts, notebooks, a messenger bag and a canvas artwork set (seen in THIS composite, made by my friends over at PixarPost.com). This steel bottle stands at about 10" tall and holds 14 oz. (Not dishwasher or microwave safe). Original retail was $19.95. There we have it! 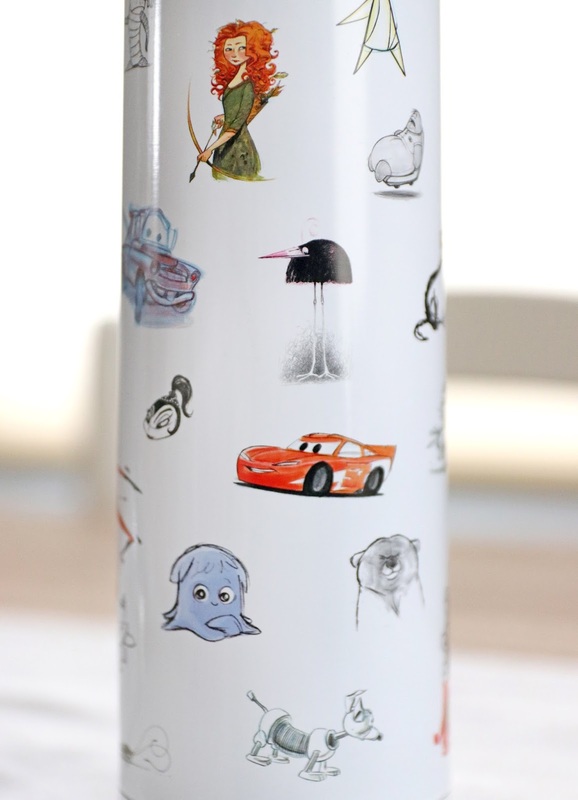 33 Pixar concept art sketches total. Phew! 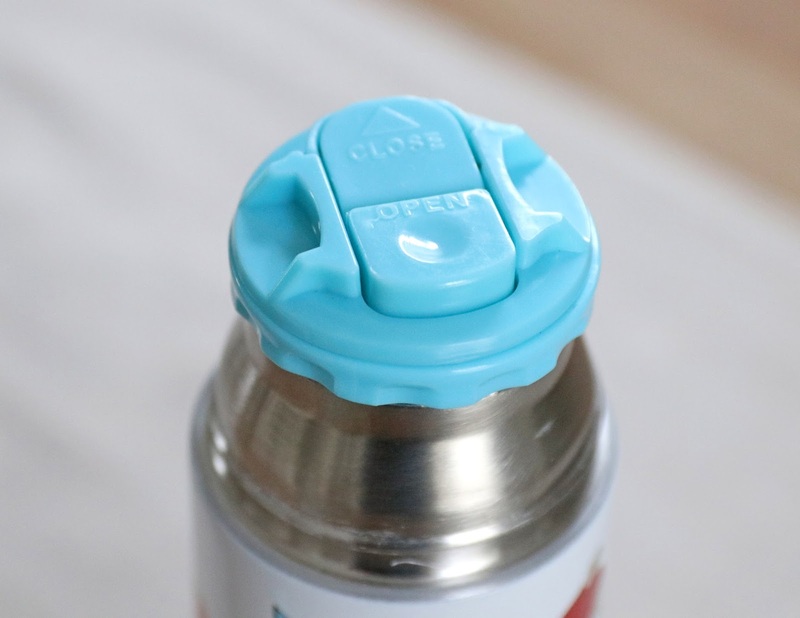 And lastly, here's a really cool added touch: the topper twists off and doubles as a cup! 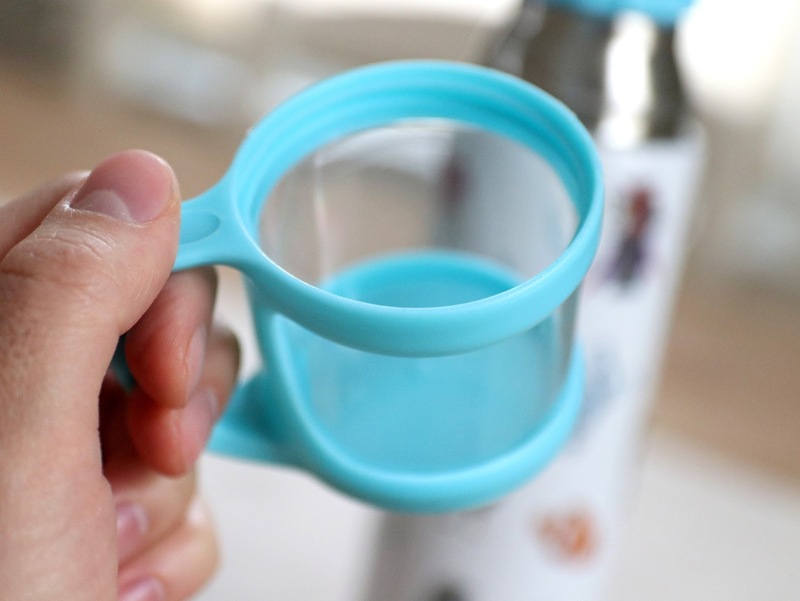 This plastic sipper part can be easily opened or closed at your sipping convenience and can also be removed by twisting it off. Did you pick this up when it was available? How do you like it? Let me know your thoughts in the comments below!